The Composite Registry's is please to offer Destron Fearing Ear Tags, RFID Tags and supplies to breeders, producers and livestock owners. Destron Fearing Duflex is the only ear tag with patented InfectaGuard coating, an anti-microbial agent intended to facilitate proper healing by reducing the risk of infection and disease transfer which aids in improved ear tag retention. In 1945 Destron Fearing™ created the country's first commercially marketed visual identification tags for livestock. This is the foundation of today's animal identification solutions for producers worldwide. Destron Fearing™ continues its tradition of leadership by manufacturing a range of innovative visual and electronic identification products, helping livestock producers reliably identify their animals and better manage their operations. Rugged, lightweight and available in a variety of fade-resistant colors, Destron Fearing™ panel tags are designed for superior retention, all weather performance and easy application when used with the Pro-Grip™ or ProGripII™ Universal Tag Applicators. Destron Fearing "840" or US Country coded Ear Tags and RFID Tags are an official tag that is recognized by all States and meet the requirements for regulatory programs for interstate commerce, disease control programs, etc. RFID tags are available in 2 different version, the yellow tags are Full-Duplex and the White tags are Half-Duplex. 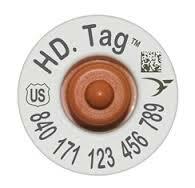 The White Half-Duplex tags have HDX technology and are considered “the gold standard” for livestock electronic identification offering the greatest possible read distance. These products provide a 15 digit unique animal ID number that begins with 840 which is the USA country code. 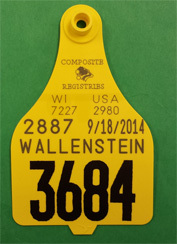 The US Shield is printed on both the front and back of the tag along with "Unlawful To Remove "
For livestock owners to utilize "840" tags, a valid premise registration number is required that is issued through your state animal health office. Tag numbers allocated to you will be uploaded to the Animal Identification Management System maintained by USDA Veterinary Services. "840" visual ear tags are available in white or yellow and may be custom printed with a line of text and a management code. "840" RFID tags are available in yellow which are Full Duplex and in White which are Half Duplex. Destron Fearing "840" Ear and RFID tags meet the requirements of the Animal Disease Traceability (ADT) rules which are now in place. Cattle affected by this rule are: all sexually intact cattle and bison over 18 months of age; all female dairy cattle of any age; all dairy males (intact or castrated) born after March 11, 2013; Cattle and bison any age that are used for rodeo, shows, exhibition and recreational events. Feeder cattle of beef breeds that are less that 18 months of age are not included in this requirement. Customized tags can help to make livestock management easier because they offer you an opportunity to custom print ear tags for your opperation that can provide visible information on the tag for each animal. The laser printed tags are highly visible and are guaranteed not to fade for the life of the tag. Tags can be custom printed with any of the following information: Date of Birth, Sire code name, Sire NAAB code, Dam ID number or name, Farm Name, etc.